...based in Chorley but covering Manchester, Wigan, Bolton, Blackburn, Preston and with easy access from Blackpool, Burnley and Warrington via the Motorway network. The North West Allergy Testing Clinics have over 20 years’ experience in helping those suffering from Allergy and Food Intolerance problems. The North West Allergy Testing Clinics have provided non-invasive Allergy and Food Intolerance testing services for over 20 years in the Manchester and Lancashire areas, and helped thousands of people improve their health by identifying and helping them eliminate many of the basic underlying imbalances which have caused their health problems. The Bio Resonance © PRO system is the very latest in Computerised Electro Dermal (Skin) Screening (CEDS). It ‘stress tests’ the body’s energy system to screen for a whole range of potential problems. 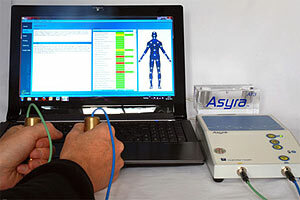 The Bio Resonance System is the most advanced technology in the field of energy medicine, and it is the first Bio-Energetic health screening system in the world to have its hardware and software approved by the United States Food and Drug Administration (FDA), the largest Healthcare Organisation with responsibility for over 315 million people. The Electro-Dermal Screening System can be found in Hospitals and Doctors' Surgeries throughout the USA. The Technology is similar to a Electocardiogram in that small pulses of electricity are passed throughout your body via the skin (Electro-Dermal), and the results are displayed on a screen similar to a heart monitor; totally painless. Is the food you are eating making you ill? Would you like help to change your diet, nutrition and lifestyle to get your health and life back on track? North West Allergy Testingcovers the Whole of the North West including Manchester, Bolton and Preston. We have provided non-invasive testing services for over 25 years and helped thousands of people improve their health by identifying and helping them eliminate many of the basic underlying imbalances which have caused their health problems. Bowel health is the number one key to good health. The bowel is the main route for toxin elimination and is where many minerals, water and other substances are absorbed. It also plays a very important role in immunity and believe it or not, the bowel is classed as the second brain! As well as carrying 1000's of neurochemicals. Lots of things can go wrong with digestion and bowel health. Some of them are relatively simple to deal with, and others a lot more complex. Over the years we have seen many people with a diagnosis of ‘IBS' or myriad digestive symptoms which turned out to be caused by one of the factors below. Our Monthly Special Offers change every month .Sometimes we offer our Advanced Plus + Test, which tests for over 320 Foods plus Testing for specific Allergies, as well as testing for Vitamin and Mineral deficiencies. This is £160 and this month only is priced at £160. Also we may offer our Digestive Health Analysis, focusing on Digestive Issues; for example IBS, Bloating, Wind, Acid Reflux etc., as well as testing for 260 foods. It also tests for issues with digestive function. Price was £140 now £140.